Deal Categories: Minerals and Vitamin Products. Webvitamins.com offers Alive! Women’s 50+ Multivitamin and Multimineral (50 Tablets) for $6.98. Shipping adds only $3.99. The best price we could find anywhere else is $9+shipping. Deal Categories: Minerals and Vitamin Products.Stores: Supplement Hunt. during checkout at Supplement Hunt. Fire-up neurological activity and bridge the Mind-to-Muscle connection. Deal Categories: Minerals and Vitamin Products.Stores: All Star Health. 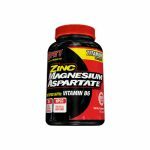 The price for the SAN Zinc Magnesium Aspartate (90 caps) listed for $19 & now $7 at All Star Health. Even with shipping this is the best price we could find. Buy one Controlled Labs Orange OxiMega Fish Oil (30 softgel) & get one free for $16.99, with Supplement Hunt coupon ‘controllOxiMega‘ at checkout, to get this deal. This is the best price we could find by at least $15.